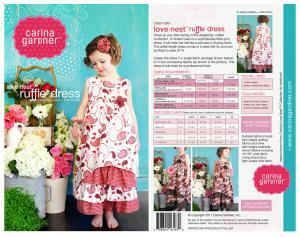 Dress up your little darling in this delightfully, ruffled confection. A modern take on a sophisticated little girl’s dress, it will make her feel like a princess in flowing skirts. This ankle-length dress comes in 5 sizes (XS-XL) and can be fitted to sizes 2T-8. Create this dress in a single fabric or in two contrasting fabrics. This dress is fully lined for a professional finish.